This non-circumvention agreement allows you to disclose information regarding land promotion or property development to someone else in confidence, knowing that if the third party uses or shares that information, he or she becomes liable for compensation to you. A non-circumvention agreement operates in much the same way as a non-disclosure agreement, or confidentiality agreement. However, whereas the normal requirement for an NDA is simply for non-disclosure to anyone else, a non-circumvention agreement takes the protection of ideas a stage further in that the recipient of the information becomes liable to the discloser if he or some third-party uses that information during the specified period. The specific purpose of this document is to enable discussion of proposals connected broadly with land and property development, so that someone who has ideas about developing a particular piece of land or a building can safely discuss his or her ideas with someone else, usually with a view to the involvement of that second party, without risk that the second party will take over the deal alone. 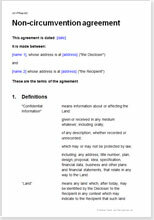 Either the discloser or the recipient of the information can initiate use of this agreement. Usually it would be a land promoter who would edit it in order to disclose information to a property owner, a builder or a developer. It might be used to explore options very early on – for example, to see whether a large land owner might be interested in the promoter carrying out initial research. It is likely to generate trust between the parties, enabling open exchange of ideas. If the promoter has carried out initial research or has expertise in a particular area (for example, knowledge of the local plan), he or she will be able to share some of this with less concern that the other party might use it without him or her for their own commercial advantage. The document template is written in plain English with a structure that only requires you to delete what is not needed, rather than find words of your own to add in. Not only does this make it easy to edit, your other party is far more likely to be happy with an agreement he or she can understand without translation by a lawyer.